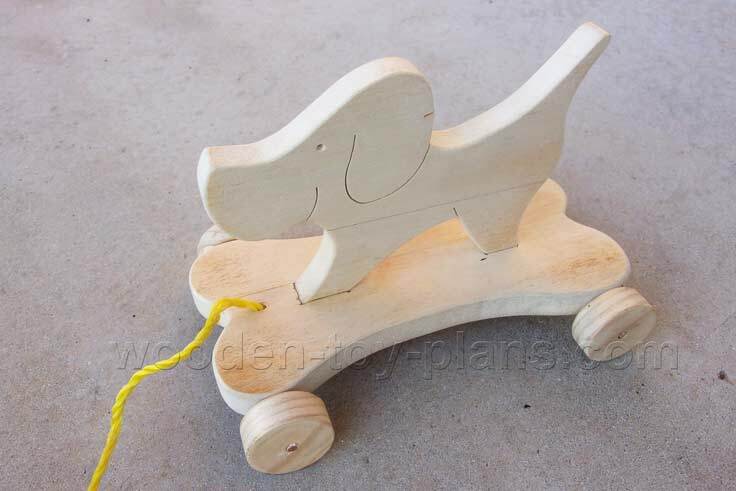 Are you looking for easy scroll saw patterns that are not too easy, not too difficult, but just right? Having recently acquired an entry level scroll saw, I was looking for a pattern to practice on. 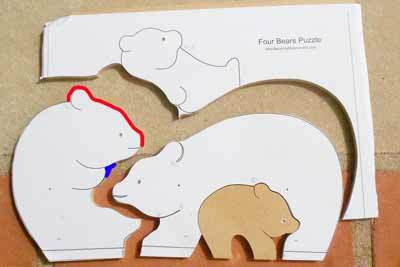 This four bears animal pattern makes a good project for beginners. It was one of my very first animal scroll saw projects. 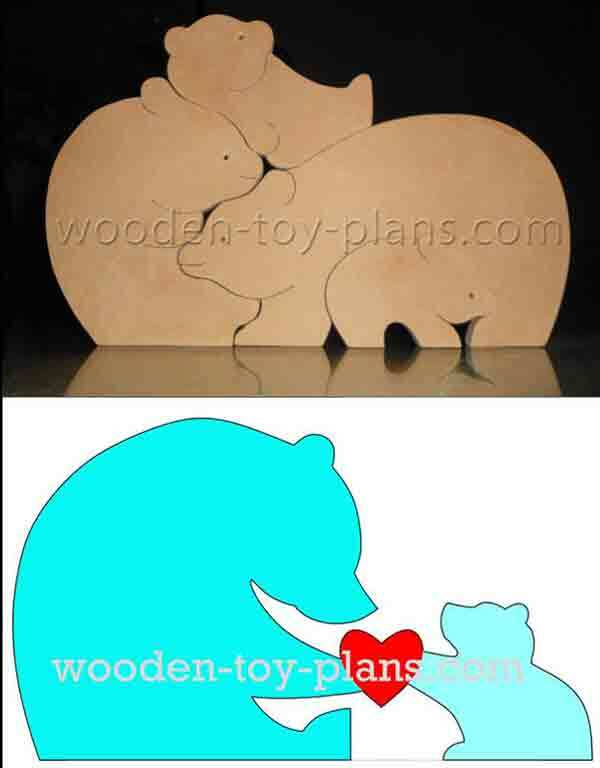 To complete this project, you will need a scroll saw. Instead of drilling holes for the eyes, you could easily use a center punch. For this project, I used 9mm (5/8 inch) Medium Density Fibreboard, also known as MDF. One thing I learned very quickly is to resist the impulse is to jump in and start cutting away. Discovered it was very easy to paint myself into a corner, so to speak. Very early on I would find myself quite happily focused on following the line, then realise I have come to a sharp corner, and the only way out is to unclamp the blade. This is a bit more of a problem with pinned blades. Fortunately, it was a scrap piece, so it was no great loss. Decided it was a better idea to try to make the shortest cuts first, which generally means cutting out the smallest pieces first. There was also another trick that I learned on the band saw, and it is easier to explain by the examples that follow. 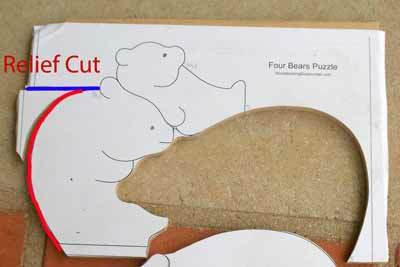 Starting with the smallest of the bears the very first cut is marked out in blue. Next I cut along the line shown in red. Because this is a relatively smooth curve, I managed to carefully back out from here, with the machine switched off, of course. 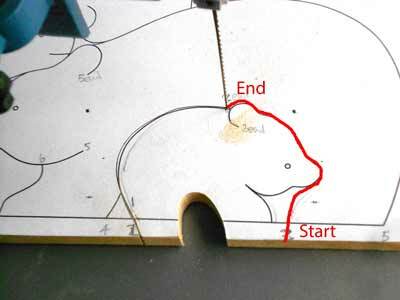 Next, cutting along the red line and the small bear is released. Finish off this piece by making the cut that defines the ear, shown in red, then along the front leg. It should be easy enough to back out of these short cuts. Cut under the chin shown in blue and drill a small hole for the eye, or use a center punch on both sides. The thin blue line is what I call the relief cut. This is short enough to back out very carefully with the machine switched off. 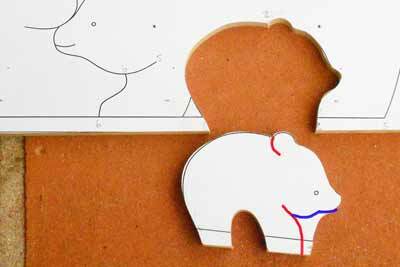 This enables me to cut all the way around on the red line, and the second bear pops out. Finish off the second bear by defining the ear and the mouth, and defining the eye. 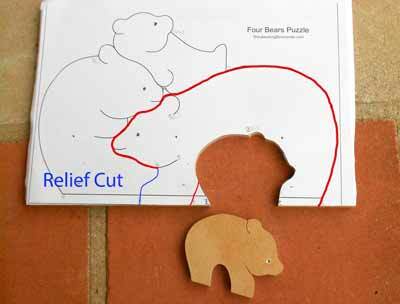 Make a relief cut as shown by the blue line. Cut along the red line. Cutting along the red line to detach bear three. Clean up the areas shown blue, and make the small cuts that define the features. 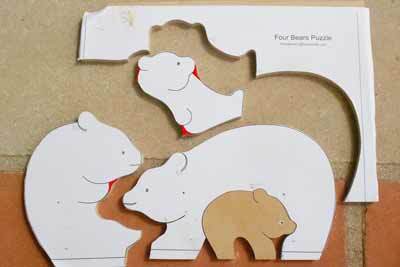 In this final step, bear number four is cut out. There was no need to make a relief cut for this step as we can see by the areas marked in read. Full size print ready template patterns free to download. 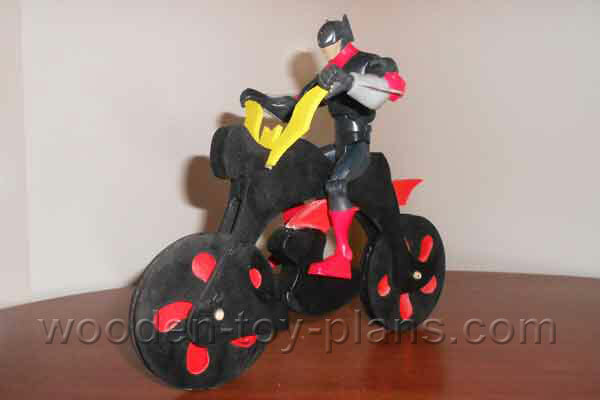 Includes the full size patterns and step by step instructions. Save the PDF file to your computer so that you can print it later. 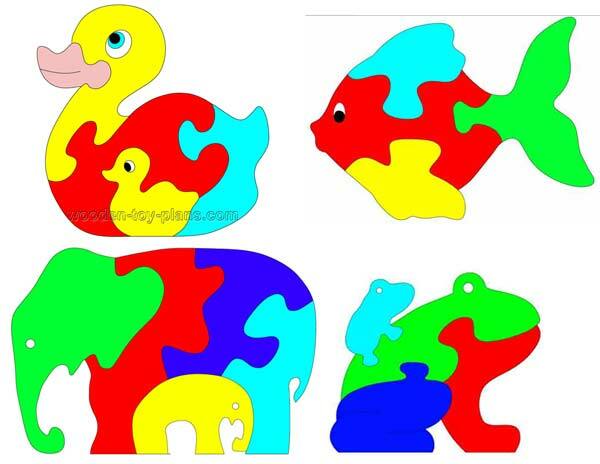 A selection free animal puzzle patterns. 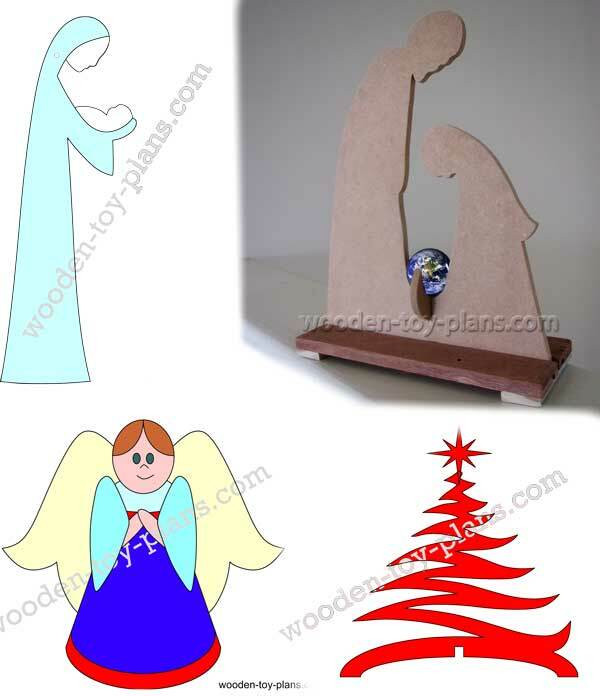 Free scroll saw pattern complete with instructions and photos. Another scroll saw pattern to practice on, also free to download. Looking for something with a bit more challenge? 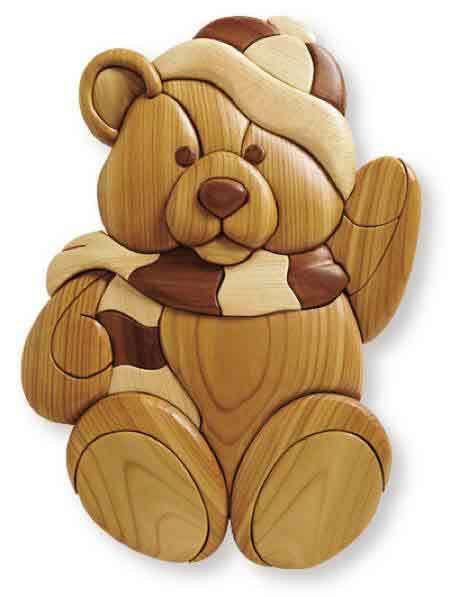 How about this intarsia teddy scroll saw pattern from WoodworkersWorkshop® Online Store. 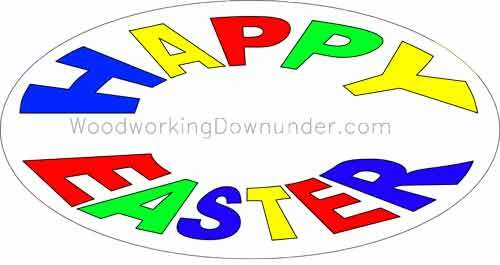 Click here to shop online at the WoodworkersWorkshop website. Search for the term intarsia teddy. Priced at $9.95 for the downloadable PDF version, there is also a paper pattern available.